Right now, board members have three options, said LA Unified’s general counsel David Holmquist: They can appoint someone to serve out the remainder of Rodriguez’s term, they can call for a special election which would likely be held next spring, or they can do both, appointing someone to serve until an election. Along with UTLA’s demand for a transparent process moving forward, union President Alex Caputo-Pearl said Rodriguez’s votes on 4-3 decisions should “be reconsidered or thrown out completely” — including Rodriguez’s vote to start the hiring process for current Superintendent Austin Beutner. Beutner was ultimately elected with a 5-2 vote of the board. 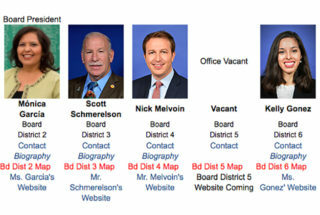 This article has been updated to add that Beutner was elected 5-2.